Pricing Table PSD is full layered, 3 comparison table type PSD. Such quality PSD usually sold in various website as a premium download. You can easily modify and use for your purpose. 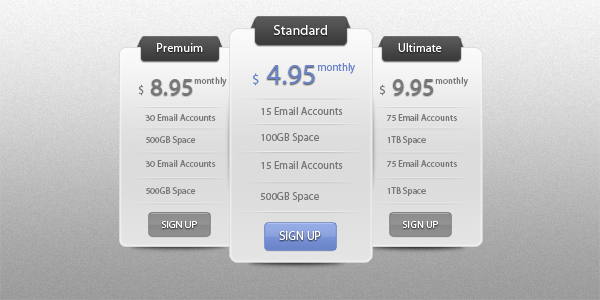 Pricing Table PSD is created by slayerD1. The artist says, I created this Slick Price Table with the help of a great tutorial and the help of Photoshop CS5, feel free to download the psd. It is a PSD download, the file is 5 MB in size. This Article Has Been Shared 6176 Times! Award Badge in Copper, Silver and Gold Flavor Full Layered PSD contains a set of 3 badges editable PSD files for personal usage. Awesome thank you for sharing Abhishek, appreciated! Cite this article as: Abhishek Ghosh, "Pricing Table PSD – Fully Free Premium Quality Layered PSD," in The Customize Windows, October 28, 2011, April 19, 2019, https://thecustomizewindows.com/2011/10/pricing-table-psd-fully-free-premium-quality-layered-psd/.